We provide secure Wireless Network Solutions for a whole range of different businesses with products and services flexible enough to suit the needs of all. Our expert knowledge, extensive research and years of experience with wireless networking solutions assures our customers that they’re getting secure, reliable and easy to manage high performance networks. The products we install have been powering businesses across Poole, Bournemouth and Dorset for many years. It’s our personable, reliable service that inspires trust in organisations and we make sure to foster these relationships as time goes on. Faster data transmission feeds of up to 3 times faster with gigabit WiFi 802.11ac technology, connect more devices, run unlimited apps and still keep your network running efficiently thanks to the intelligent traffic management system built in. Our technicians will install and deploy these access points within the organisation, not only do they look great as standalone devices but they’re paired with an intuitive web-based configuration program so you can see how your networks are performing. 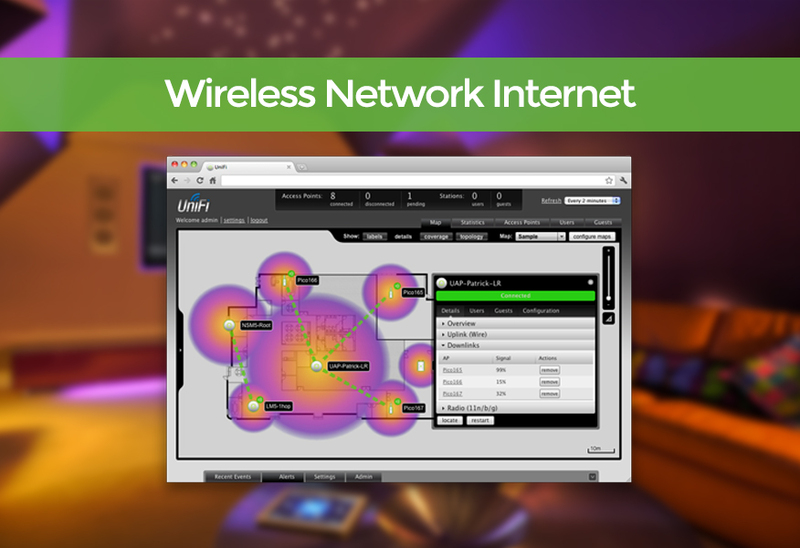 Easily expand the wireless coverage within a building using controller-less technology without the need for additional hardware to connect to multiple different points. For external wireless network solutions, UniFi from Ubiquiti creates a highly scalable end-to-end system spanning multiple networks across the region, country and world – all controllable in a single interface accessed on the web or local network. Public network access for guests has become not only a valuable feature but a necessity in hotels, cafes, airports etc. Give your guests a professional looking and performing secure access login with a customisable page for better user experiences. Speed and security are the highest priorities for guest networks, these are addressed by successfully separating temporary users to permanent users within an organisation on an easily manageable web-based system. Advanced encryption and security protocols come as standard with our partner Ubiquiti’s wireless networking solutions making your wireless network just as secure as a wired counterpart would be. Wireless Network Solutions use Power over Ethernet that allows a single CAT5 cable to provide both data connections and electrical power to PoE devices, like Wireless Access Points, VOIP Telephones, and IP CCTV Camera Systems.